You may have Sensitive information stored in a removable drive. Are you worried that if you lost it, then those data might be used against you.. You need not worry about that. 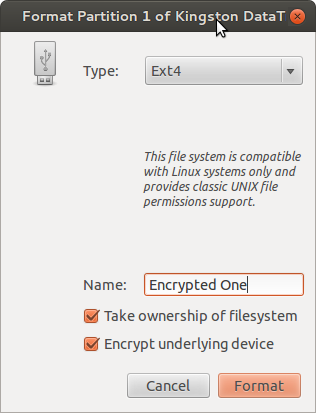 There is a way to encrypt your Removable Drive the easy way in Linux. Encryption is the process of converting a data from understandable format to non-understandable format. Thus if one tries to access the encrypted data without the key, they will have less chance of cracking it to get the original information. Thus only with proper key, you can access the original data. Under the Peripheral Devices, select the Device which you want to encrypt. Then Click on 'Format Volume' . Then enter the passphrase in both the text fields. After successful completion, you will see a layer named Encrypted with a lock at the right bottom corner. This is a proof for the fact that your drive is encrypted. Now, you can access the files only if you enter the correct passphrase. 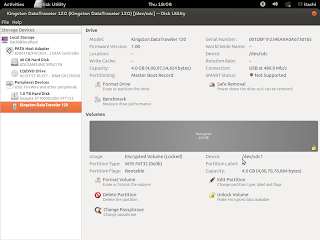 To return the drive to normal (unencrypted), click on 'Lock Volume'. 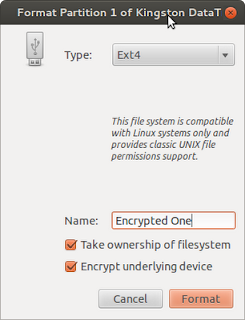 Now format the drive without 'Encrypt the underlying device' marked. DISCLAIMER : For accessing the Encrypted content under Windows, you have to install FreeOTFE. However you can also use the Drive as normal after Formatting it.